In April, Renault teased us with an image talking about the marriage of electric of electric vehicles and Formula 1 motorsports. It seemed impossible that it meant Renault would team up with the Formula E series, especially as they seemed to already have partnerships lined up with Dallara and McLaren. It made more sense when they unveiled a Twizy outfitted with a Formula 1 KERS system as a kind of publicity stunt. But a new announcement from Renault says that, indeed, they are teaming up with Spark Racing Technologies, the technology arm of the Formula E.
Or, as they put it: "Renault SAS, leader of Electric Vehicle and expert in motorsport, has signed on as official Technical Partner of Spark Racing Technology to supply the Formula E cars to be entered in the FIA Formula E Championship." Renault not only is already involved with Formula 1 racing, but has a range of electric cars it manufactures. The planned 42 Formula E single-seaters for the 2014 season will be named "Spark-Renault". They released a rendering of the car (shown above) as well, which matches the sketch released a couple months ago. "Renault has demonstrated a unique commitment to zero-emission mobility, with a range of four cars available for sale. Renault in Europe, and the Renault-Nissan Alliance worldwide, has gained a position of EV sales leader. Formula E is an exciting opportunity to demonstrate the excellence and the reliability of our EV solutions," said Philippe Klein, Executive Vice President, Corporate Planning, Product Planning & Programs of Renault Group. "We believe that motorsport is an efficient manner to promote the efficiency of new technologies, and we're eager to use that single-seater in FIA Formula E championship to show our technology is the best." "Renault and Formula E both share the same commitment to innovative technology and sustainable motoring and we're delighted to welcome them to the Championship as a Founding Partner," said Alejandro Agag, CEO of Championship promoter Formula E Holdings. "Not only is Renault one of the world's leading car manufacturers, with a very successful motorsport pedigree, it is also a pioneer for electric vehicles being the first full-range car manufacturer to market zero-emission vehicles. To have a manufacturer of this caliber onboard is a great testament to the growing appeal of the FIA Formula E Championship." "Spark Racing Technology is extremely proud to have a new major quality player in motorsport, Renault," said Frédéric Vasseur, CEO of Spark Racing Technology. "Their record and involvement in high level motorsport speaks for the brand. In addition, Renault has always been at the forefront of innovation and having their expertise and know-how is invaluable at such a key moment in the creation of the FIA Formula E World Championship. This partnership with Renault is a new corner stone in a building harmoniously taking shape at all levels." "Renault's expertise in electric powertrain design and integration acquired both in production E.V. 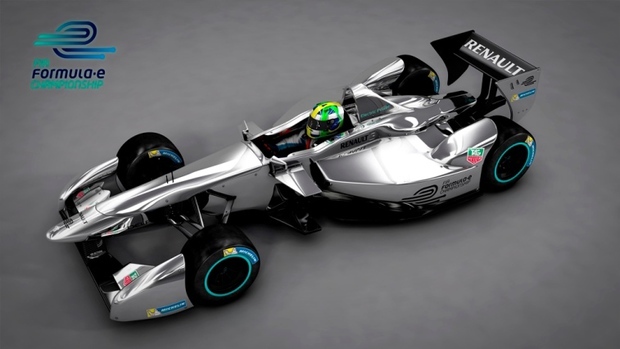 and in Formula 1 makes Renault Sport a natural partner for Spark in this exciting Formula E project," said Patrice Ratti, Managing Director of Renault Sport Technologies. "Engineers from Renault Sport F1 and Renault Sport Technologies will collaborate with Spark Racing Technology team to optimize the electric and electronic layout and performance of the powertrain. Our experience will be particularly valuable to ensure the safety and reliability of the car."